Last week the CMS actuary released a report about the cost of healthcare reform that seemed to come to more negative conclusions than the CBO. I didn’t post about it because, to a first estimate, it seemed pretty similar to the CMS actuary’s report from last November. We already went through a big left-right brouhaha about what it meant back then, and I didn’t really feel like going through it again. 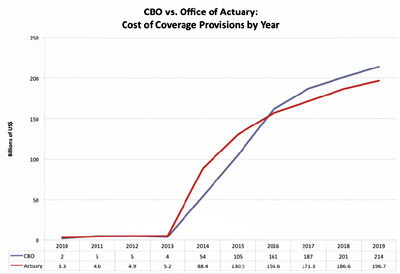 ….If anything, the Office of the Actuary seems to like the bill more than CBO. This is particularly true if you look at coverage cost by year, as the following chart does….The table shows that the costs don’t really start building until 2014. For the first two years, the actuaries project higher costs, as the red line is above the blue one. But starting in 2016, the actuaries project lower costs. That’s why the red line falls below the blue one. To summarize: The actuaries project lower coverage costs overall, and they project costs to decelerate faster than CBO does. It’s worth noting that a big part of the supposed disagreement between CBO and CMS involves the question of whether the cost saving measures in the healthcare bill will work. But that’s an issue where neither agency really has any more expertise than anyone else. It’s mostly a question of pure political will, and on that score your guess is as good as mine — or theirs. In any case, the bottom line is that there’s very little disagreement here. Roughly speaking, we’ll see a trillion dollars in increased costs and half a trillion dollars in cost savings. The remaining cost is paid for via a variety of taxes and fees. Pretty simple.